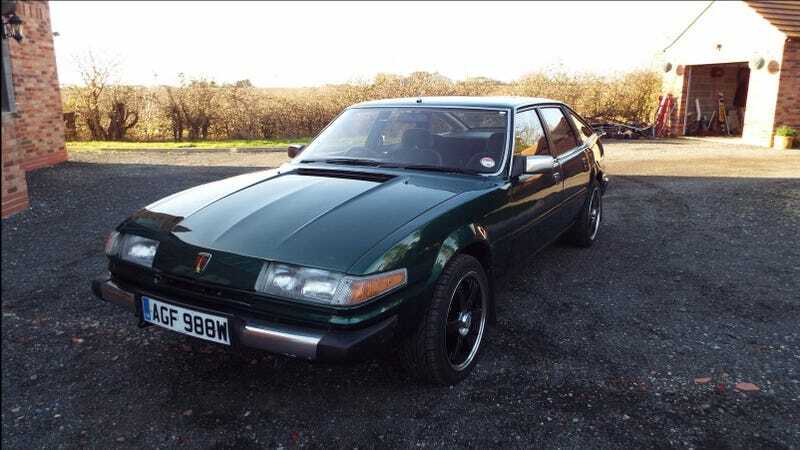 1981 ROVER SD1 LEXUS 4000 V8 Engine | Cars, Motorcycles & Vehicles, Classic Cars, Rover | eBay! Ad copy for those blocked from ebay "1981 series one Rover fitted with a 1991 Toyota/Lexus 4000 quad cam V8 from a Toyota Soarer. The engine and auto box have been fitted from the soarer complete with cats, and the soarer wiring loom integrated into the car as well as the standard rover wiring loom. There is no modification to the Rover body with the exception of the radiator mounting as the standard soarer rad is fitted. The soarer LED dash is also fitted to allow all engine diagnostics to work as they should. A brand new modified front subframe is fitted with the soarer engine mounts on and the gearbox is linked well to the rover gearstick. A bespoke propshaft was made using the rear rover coupling and the front soarer coupling. The rear axle is standard rover ratio of 3.08:1. The soarer diff ratio was 3.9:1 and I have a Rover diff of this ratio to fit if desired. Standard Rover fuel tank is used with an external swirl pot and in-line high pressure pump. A bespoke exhaust was made using soarer and Rover parts. The car was completely stripped and sprayed at a local body shop, the car has never had any welding done because of rot and does not need any , the only repairs needed where to the rear quarters as they had been damaged and filled over. The car has no filler. Lowered/uprated springs, new adjustable shocks all round, four pot callipers to the front, front discs, rear drums, master cylinder, servo, copper brake lines, wheel bearings, rear shoes, front bumper, tank filler, tank cap, lock and door handle set, door latches, full poly bush set, windscreen, headlining, and many more small parts. Brand new alloys and tyres as you can see and I have the original wheels with new tyres on if required at extra cost. The car drives very well and is obviously pretty quick compared to any other SD1 out there. There is no vibration and the car goes through the gears as it should. I can take anyone for a test drive here in Hornsea, I have the car insured with Adrian Flux as a modified classic which was only £140 for me. The interior of the car is all original and is not as good as the exterior although there is a new carpet, as if I kept the car I would get a new interior made. If you are serious give me a call on 07725 302067. So if you fancy a unique car that will go as good as it looks here it is."